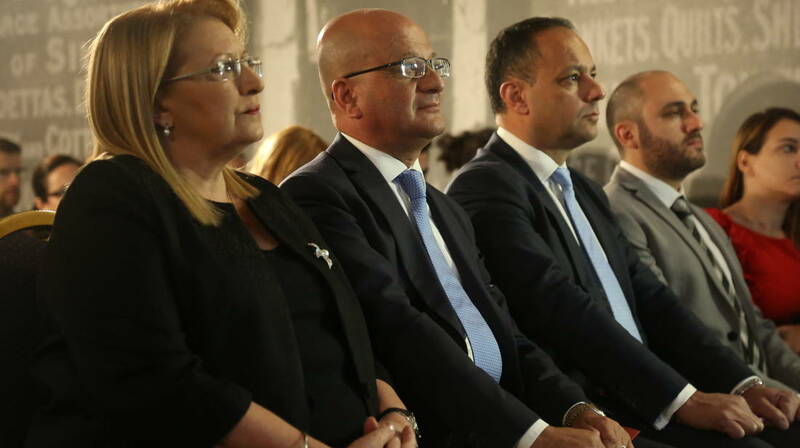 Her Excellency Marie-Louise Coleiro Preca, President of Malta; Parliamentary Secretary for Consumer Protection and Valletta 2018 Deo Debattista and Valletta 2018 Foundation Chairman Jason Micallef, during the official opening of Valletta 2018's fifth Annual Conference, this year titled 'Sharing the Legacy'. Today marks the official opening of the fifth edition of the Valletta 2018 Annual Conference, this year titled Sharing the Legacy. The opening address was delivered by Her Excellency Marie-Louise Coleiro Preca, President of Malta, Parliamentary Secretary for Consumer Protection and Valletta 2018 Deo Debattista, Valletta 2018 Foundation Chairman Jason Micallef and Valletta 2018 Research Coordinator Graziella Vella. Parliamentary Secretary for Consumer Protection and Valletta 2018 Dr Deo Debattista said that “by the Valletta 2018 projects; Valletta a former cryonaut, has been revitalised into an athlete leading a legacy bound to success”. Valletta 2018 Foundation Chairman Jason Micallef said that “Without culture, cities as vibrant life-spaces do not exist; they are merely concrete and stone constructions, prone to social degradation and fracture”. He continued that “Culture reminds us of our humanity. Excitement and wonder and aesthetic pleasure are more than a set of luxuries reserved for the elite. Everyone deserves them. We must revive the sense of fellowship and discourage selfishness”. The creation of various projects for the economic and cultural regeneration of areas which had previously been abandoned as well as the creation of projects which encourage community participation, among others, are some of the cultural practices that are able to foster a more vibrant and diverse city. This is precisely what the Valletta 2018 Foundation has been working so strongly on over the past years. Therefore, this year, the conference will explore the legacy of Valletta as the European Capital of Culture, in light of the economic, cultural and social regeneration that has already been made as well as that which is currently in progress. The concept of sustainability will also be discussed, while looking at how development can happen sustainably, to meet the needs of the current generation without causing inconvenience to those of the future. These reflections allow for a greater understanding of the long-term impact of Valletta 2018. A number of distinguished international speakers will talk about the work done in each of their respective cultural fields, in order to give different examples of how further economic, social and cultural development can be made. François Matarasso – art academic and community worker – will talk about participatory art, while Justin McGuirk – head curator at the Design Museum in London and design critic for The Guardian – will talk about urban regeneration in cities and its effects. Pascal Gielen – professor in cultural sociology at the Research Institute of Arts in Antwerp – will speak on cultural policy and the relationship between art, politics and public space within the city, while Ujju Aggarwal – cultural anthropologist at Parsons School of Design – will be talking about public schools and the impact that their systems have on the rest of the community. The Valletta 2018 Annual Conference: Sharing the Legacy, is spread out over three days, with the last day being Friday 26th October. It is taking place at Fort St. Elmo in Valletta. For more information and to stay updated, visit conference.valletta2018.org and follow Valletta 2018 on Facebook.